As Angel Olsen proves over the course of her new compilation Phases and many artists before her have, these collections not only are an opportunity for the artist to give insight into the creative process, but also let us hear a batch of songs that might be strong, but may not have fit into the thematic or stylistic arcs of their LPs or EPs. Given the right circumstances, it’s absolutely a respectful and respectable gesture on the musician’s part and thank God Olsen chose to do so, because not only does this album show her growth as a songwriter throughout, but it also manages to pack in some of her finest tunes to date. When it isn’t transcending the lines established by her previous output these songs demonstrate her singularity as a vocalist/lyricist and the uncompromising narratives that run like a taught electrical line through each of her albums. As a career narrative, Phases sounds like it’s moving backwards chronologically from the rousing clarity of the productions and songwriting of MY WOMAN to the nimbler campfire songs of Half Way Home, the more current songs juggling an emotional punch with pop muscle without ever losing the haunted house cool of her earlier releases. For some the songwriting might lose steam as the album progresses, but what it lacks in songwriting chops it more than makes up for with Olsen’s strengths as a vocalist and her lyrical evocations. If those assets don’t make for a robust enough listen, it could simply function as a tone-poem, sonically evoking a world of lonely Victorian houses and ghosts that never allow for the dust of inner turmoil to appropriately settle. For the enlightened, Olsen’s career has offered a cornucopia of sonic riches, from the burning lonesomeness of her voice, on full display throughout the album, to the way she is able to harness the power of old-time cowboy music and turn it into not only something modern, but also transcendent and sensual in its own right. The first three tracks here, for example, operate in a fashion similar to that of MY WOMAN’s first three tracks, conveying a knack for melody, tenacity, and ambiance unparalleled by her peers, each coloring in a distinct shade of the Angel Olsen oeuvre. Where MY WOMAN includes an opening trifecta that shades one side of Olsen’s sonic depth however, on Phases we get the breadth of the prior album’s scope concisely within three songs. “Fly on the Wall” has the pop-chops of MY WOMAN’s opening trifecta, but re-contextualizes them with somber martial urgency. “Special,” a live staple, wades up to the neck in the spacier stratospheric cuts like “MY WOMAN” and “Sister”. Finishing out the triptych is the hallowed tumbleweed blues of “Only With You,” a repurposing of the quiet thunderousness imbued in tracks like “Heart Shaped Face” and the broken beauty of “Those Were The Days,” taking the taught ferocity of those tracks and channeling it into the most stirring and melodic moments of her career. Were this a proper follow-up it might feel like Olsen was uncertain of how to scale the massive expectations that will undoubtedly be heaped on her going forward, but considering that these songs came from those same sessions, it only makes her ability and distinctiveness feel all the more formidable. These first three tracks are on par with her best and further strengthen her clarity of vision when constructing MY WOMAN. Leaving these tracks off of a record should be out of the question, but Olsen was entirely able to construct a modern masterpiece despite their absence. As if the opening triad weren’t enough, it turns out there’s an entire album that follows it and does so by mostly paying homage to her more understated side, likely of a result of their having been crafted prior to MY WOMAN’s southern epics. While the sonics here are entirely familiar to those acquainted with Olsen’s now well-established penchants, there is plenty to offer in terms of mood and lyricism, not to mention the enigmatic riches to be had from her voice. “All Right Now” maintains the clarity and succinct production choices of late, but applies them to the near-whisper heartbreak of earlier releases. On this track, the focal point of the lyrics offers respite to the tumult brewing in the first three tracks and works as a great segue into the muted impressionism of “Sans,” which lays down the stylistic tone of the album’s latter half. The one exception to this rule is the odd Chris Isaak tribute “Sweet Dreams,” which carries itself, musically, with an erstwhile brawler’s combativeness, but as soon as that familiar “Wicked Games”-howl hits it feels like you know exactly why she left this of of her album. All of the Olsen familiars are there, but the song itself falls flat because of its austere similarities. Shortly after this low comes another sucker punch with “California,” a song notable not only for its pleasant breeziness but also for its strident vocals. “California” exhibits what can happen when an instrument is used improperly as Olsen warbles her way from register to register, overly affecting her vocals to truly grating ends. Ultimately, as a document of what-could-have-been, it’s a pleasure to hear Olsen’s failures and successes side by side. The songs themselves might be brutally honest, but they also suggest a meta-narrative for the album, one in which Angel Olsen, the creator, demonstrates her own vulnerabilities as a songwriter. Maybe this just offers a more discreet sampler of what Angel Olsen has to offer to uninitiated audiences. Though there might not be anything as immediate as “Shut Up Kiss Me” or as indie-pop-baiting as “Intern,” that same songwriting prowess and power are on full display here. From the streamlined beauty and tumult of “Fly on Your Wall” to the humble devotional “Only With You” to the lo-fi highlight “How Many Disasters,” each pulses with the urgency of someone deftly attuned to the passions and pains of life all the while remembering the ways that a hummable melody can heal. While Olsen herself might feel that it’s truly unfair to have a heart that’s still beating, her indignance only further serves to help us outline the vague contours of our own fleeting emotions. 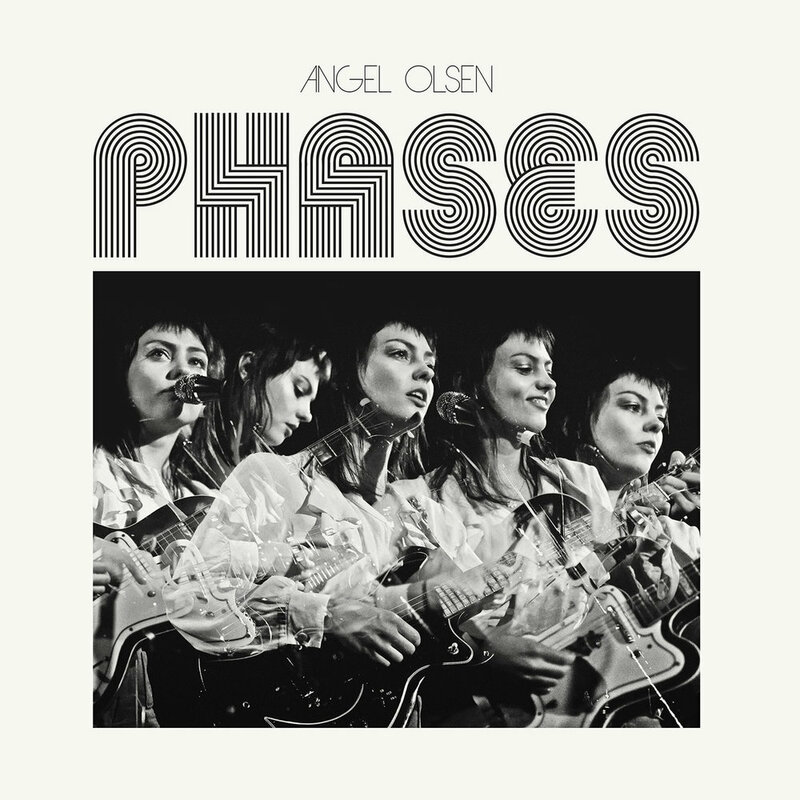 Not unlike discovering a new word, Phases provides the language of love and sorrow for the listener, offering new ways for the audience to understand themselves all the while watching Olsen’s own career arc grow and blossom.